I always feel that expressing my concern over improving Congolese population’s socio-economic conditions is an obligation. The reason is that the majority hadn’t ever tasted an importance of having a state, specifically when it comes in mind that Democratic Republic of Congo (DRC) is a potentially rich country. Unfortunately, since its existence as an independent country, most of Congolese haven’t ever had an opportunity to exercise such noble right to live as it should be. Hence, reminding and recalling political leaders, decisions-makers, Congolese’s friends or activists who can advocate in any way or another for this matter is one of the reasons this blog has been initiated. To understand how this point troubles my daily thinking, you may check again these two articles of my blog in which it is obviously stated that we deserve better conditions as do our leaders or their relatives. It can largely be agreed that an isolated country would suffer from lacking benefits of economic globalization and integration that are characterizing recent world economy. In other words, this article discusses slightly one of the requirements to travel from one state to another and how practically this works in remote regions of DRC. Though globalization encompasses benefits and challenges, it requires at least to anyone wanting to travel having his own identification document, namely a passport. Otherwise, someone’s initiatives can be hindered due to inaccessibility of such basic need and right in different countries as it would-be in DRC. Unfortunately, the cost of a passport in DRC seems to be the most burning issue making this right to be a dream as most of basic rights are. One of my friends who is living in Misisi asked me a way of establishing a small business in South-Soudan. Based on information in his hand, it looked that he could manage to initiate a business as South-Soudan was trying to climb some of the constraints it faced long ago under Soudan. He had a limited amount of money that could have helped him to start a retailing business connecting Kampala to Juba. The idea came before the recent rebellion erupted in South-Soudan. He had to check with me the way out to have a DRC’s passport and then move from mining to retailing business in South-Soudan. We tried to get information all around on how possible to get it and if possible we could venture our funds to have the business run. Misisi is an area well rich in terms of minerals, especially gold. It is located in South-Kivu Province, Fizi territory, a two days walk travel from my area, known as Minembwe Zone. It is roughly 400 Kms from Bukavu airport, Kavumu. From Kavumu to Kinshasa-Ndjili airport, you are required to flight for approximately 1600 Kms; making the total distance of 2000 Kms to travel from Misisi to Kinshasa; for the sole reason of getting a travel document. The reader will remind that the distance doesn’t take into account the state of infrastructures in Eastern-DRC as it may, in real sense, likely double the distance from Misisi to Bukavu. There is also a risk of crashes of flights that occur regularly in Congo due to lack of regulations and corruption in the domain of civil aviation. Furthermore, the cost of a round trip can be estimated as follows: The likely cheap cost of flight from Kavumu (Bukavu) to Kinshasa is estimated to $ 700; while a cheap hotel for 5 days to get your application submitted may require $500. It is also estimated that the transport coat from Misisi to Bukavu is approximately $100. As we had to pay for a lodge in Bukavu for 4 nights, we estimated a cost of $ 150 per person, meals included. The total cost of travel (round trip) culminated to $1450 before the application in itself and passport fees. The cost of a passport was unclear as it depends on connections and lobbying capability into your hands. However, passport application fees are estimated to be between $250-300; while, the cost can even increase to $400 for unknown people in the circle of the ministry in charge. It is unlikely that you can leave an office in Kinshasa without offering a beer or thee, something never seen as a bribe or seemingly illegal. That is, you will have to pay additional fees to get your application processed. In total, we estimated the financial cost of submitting a passport application floating around $2000. The cost of getting a passport application in DRC seems to be probably huge and high as compared to different countries in the world. Moreover, the reader reminds that you will have to wait for few months as the delivery goes beyond three to four months. Subsequently, it still requires experiencing communication costs to remind our public officials whose tasks would be that of delivering services and getting paid for by the state. Unfortunately, the fulfillment of their mission is far from being achieved until… In short, the cost of getting a DRC’s passport was half of my friend’s start-up capital in his hands; and we finally decided to leave that option off. The remaining story is that he had to continue with his usual business of digging minerals in Misisi. Nonetheless, he is likely doomed to stay for long into that career as the situation in DRC seems to remain probably unchanged for a while; unless, political leaders will undertake strong reforms in different areas of public services delivery. Do you think we would have any other option to get our business established in South-Soudan? Please leave a comment below. 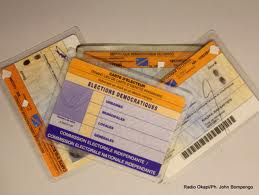 The right-hand picture above is the only identity card used in DRC when you don’t have a passport. It is simply an electoral card. 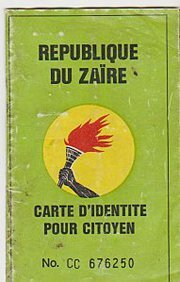 That is, since the disappearance of “Carte pour Citoyen” on the left-hand, there hasn’t yet any other identity card/document. Reblogged this on Eastern DRC Reconciliation and Development Forum. Thanks for your interest to my blog and constructive comments. I will share this information to my friends after cross check. It wiuld be a nice move, though still expensive.